This is the compact version of 'Limelight'. 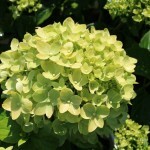 It features the same soft lime-green flowers, that age to creamy white, then a darker pink. The cone shaped flowers bloom on new wood. Useful in a shrub border or in a container. 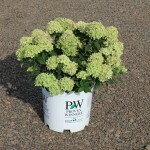 It will grow best in full sun or some shade in a medium moisture, well-drained soil. PP 22,330.